When you're in the post high school, pre-marriage stage, you know that sometimes, all it takes is one minute to change a life forever. One comment that points you in the direction of the perfect career choice. One tip about an open job. One call with the right shidduch. Sometimes, all it takes is one person to change a life forever. Sometimes, that one person is you. It's no secret that the single population accounts for an enormous amount of the chesed performed on a daily basis. Individually and as a group, the post high school contingency constitutes an incredible reservoir of talent, skills, and heart. Often, the only thing holding a girl back from maximizing that talent is the simple fact that she has no idea where to utilize it. Just a short while ago, Achiezer had the privilege of being approached by a particularly special young woman, Faige Fried. Given her experience as Chesed Coordinator at Tichon Meir Moshe, Faige knew many, many girls who would jump at the opportunity to reach out and give to others - if they only knew to whom to give. Faige had the simple but ingenious idea of contacting the numerous community organizations who really rely on volunteer work, and giving them the chance to present themselves - along with the opportunities for chesed that they offered - to her friends and others like them. The staff at Achiezer was tremendously impressed by the idea and excited as well. The beauty of the project is that it helps everyone - the organizations, the community, and the girls themselves. As Mrs. Esther Novak, Intake Coordinator at Achiezer put it, "When I have a family with a more complex situation, I can't send a high school girl to help out. There are things that post high school girls can do that nobody else can." As Esther got busy contacting the various organizations, the response was overwhelming. The organizations love the idea. It's a win-win for everybody. The result of Faige and Esther's combined efforts is a magnificent evening of information, slated to take place at the Achiezer office THIS Sunday, December 22, from 7-9 PM. During the evening, each organization will have a chance to briefly present itself, and outline the various volunteer opportunities that are available. 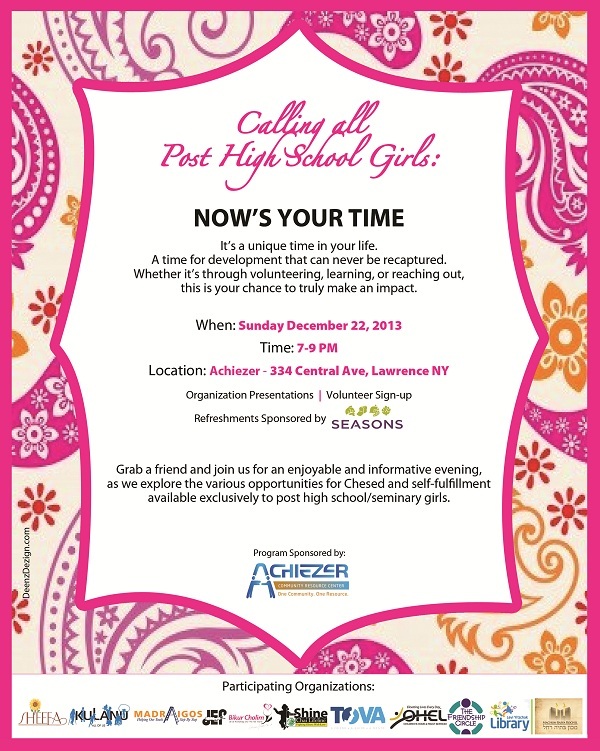 There will also be short presentations from two organizations that offer shiurim and personal enrichment exclusively for post high school girls, as well as the unveiling of Achiezer's new financial planning class, also geared specifically to this group. After the presentations, the girls will have the opportunity to meet representatives of each organization, ask questions, and sign up for whichever options appeal to them. There will also be light refreshments and time to just relax and socialize (of course!). The organizations that will be represented include (in alphabetical order): Achiezer; Bikur Cholim; I-Shine; Kulanu; Levi Yitzchak Library; Machon Basya Rochel; Madraigos; Ohel; She'efa; The Friendship Circle; Tova. If you are a post high school/seminary girl, we are turning to you. We know that you are busy; between work, school, family life, and friends, you may not have much time to spare. But whether you're available for an hour a day, an hour a week, or an hour a month, you owe it to yourself to see what there is out there for you. Because sometimes, all it takes is a minute to change a life forever. And often - when you reach out and give - the life you impact most is your own.